Airline Data Inc’s signature product The Hub is a robust database that provides all of the information you need in an easily accessible, web-based application that allows you to log in anytime, anywhere from your computer or tablet. Our domestic and international traffic data, Form 41 Financial data, inbound and outbound traffic data, industry schedule and capacity data, allows you to better understand all facets of the marketplace, down to the zip code level. And as the premier US-based traffic database, The Hub provides you with all the information you need to build business cases for targeted airlines. Plus, unlike ad hoc data purchases or other products, Airline Data Inc gives you access to the entire database 24 hours a day, seven days a week so you have the freedom to run the data you want, when you want it. domestic and international air service reported by both domestic and foreign carriers. Leakage studies data haven’t changed much in recent years. Zip-based sales data come from either a travel agency’s physical location or credit card zip codes. Both methods are seeing a decline in the effectiveness of their data due to an increase in airlines’ sales directly to consumers and less certainty about the validity of the reported zip code – which much like area codes are becoming less tied to a meaningful location. The solution is to move to internet IP-based location data, which are much more accurate for location. Using Airline Data Inc’s fully-adjusted origin & destination survey and census data, combined with internet travel data, allows robust correction that gets better and better over time. Machine learning, spotting recurring errors, and making better corrections to provide logical, fully adjusted results based on a customer’s location, where they departed from, and where they are going. ACA can identify specific zip codes that are high priority for an anti-leakage campaign attached to specific destinations. For example, if a neighboring airport is stealing an airport’s traffic, the specific zip codes leaking that traffic can be identified by volume or ratio to advertise via Google Adwords, Facebook, or other methods. Airline Data Inc is overturning conventional wisdom when it comes to assessing how well your markets are performing. Our quick, “one-click report card” grades market performance on a scale from A through F, just like your teachers did. This means everyone – from the CEO to the Analyst – will understand that an “A” is great and an “F” means you have some work to do. Quick, clean, concise, actionable. Our report card grades your markets consistently. Scores don’t change based on filters or inputs you might put on your report. 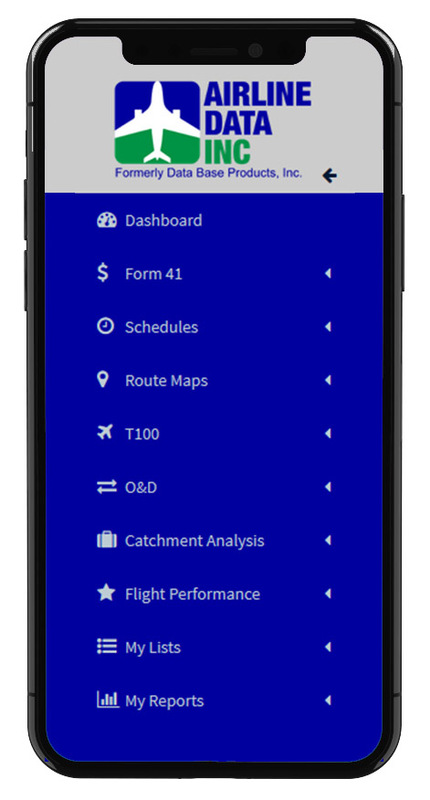 Instead, every time you run your report, you get a reliable, fair, and accurate assessment on how well your routes are performing – regardless of the aircraft, time in the market, etc. Not only does this make it easy to assess a route’s performance, but our report card grades also make it easy to benchmark your routes’ performances relative to that same airline’s other routes. They do not compare between airlines. This new module takes O&D data, as well as the T100, to create both a monthly score and a year-to-date score. That score is accompanied by Load Factors, Revenue, Average Fare, Local Traffic Percentages, and Market RASM (revenue per available seat mile). Your performance report card is available in several outputs, including By Carrier, as well as By Carrier and Destination – all of which are trended by month and/or year.